Mass vaccination programmes should reach an appropriate number of animals each year (at least 70%, but depending on the setting this threshold could be higher, e.g. in populations with very high turnover, or lower, e.g. in areas where dog movements are restricted) and maintain this level of coverage over time until rabies cases have been eliminated through frequent (at least annual) vaccination campaigns. Vaccination coverage should be determined prior to the start of the mass dog vaccination programme and following each subsequent campaign as due to dog population turnover and introductions of dogs, the number of dogs present in a given area may fluctuate. If resources are limited and coverage cannot be estimated following each campaign, it is important that vaccination campaigns are still conducted. If resources are limited and coverage cannot be estimated following each campaign, it is important that vaccination campaigns are still conducted. Click here for details of how to estimate vaccination coverage. previous page: 5.6.1. How can we find out if the canine rabies control programme has been successful? next page: 5.6.3. 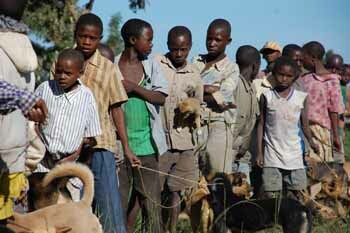 Has the programme had an impact on dog rabies cases?